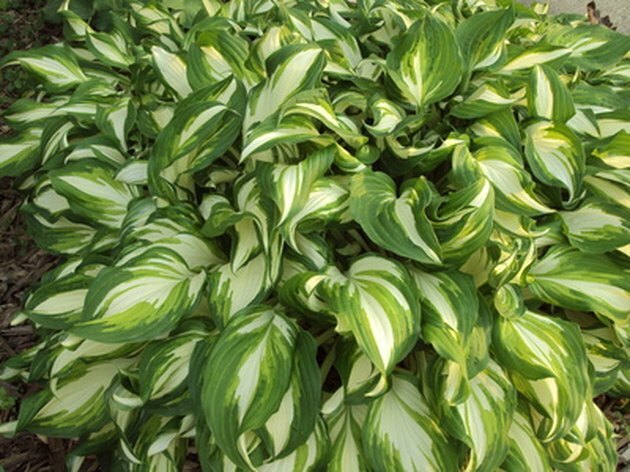 Hosta plants offer more than 40 species, each of which produce lush amounts of foliage and excel in shady gardens. They are grown throughout most parts of the country and vary greatly in size, shape color and texture. Florida, with its nearly year-round sun and warm weather, can be an ideal place for certain varieties of hostas. Growers should be careful to select one that is appropriate for their zone and provide ample shade. Certain types of hosta plant will do well in Florida. The Aphrodite hosta is a medium-sized variety that produces large white blooms during the spring and summer. Like other members of the species, they do best in nutrient rich, pH balanced soil that is kept moist, particularly in the summer. Aphrodite does best in USDA zones 3 through 9, but should not be planted in areas where they're exposed to harsh afternoon sun. The Aphrodite hosta will grow to be a maximum of 24 inches. Keeping the plant well watered in dry seasons and through extended periods of heat will help produce the largest number of flowers. In some areas, it may be necessary to protect the Aphrodite from deer, because they have been known to strip the leaves. The Big Boy hosta is among the largest species in the family. It can grow to about 28 inches tall, and produces broad leaves with a glossy green color. Like other hosta varieties, the Big Boy is extremely shade tolerant and does well when planted in shady areas and under large trees. It is generally a quick grower and requires little care once established. If planted in an area where sun is prevalent and during times of extended heat, it may be necessary to provide more water than is advised. It is important to keep soil moist, but not wet. Big Boy hosta will do well in zones 4 through 9. The Summer Fragrance is a large variety that may reach as tall as 35 inches. It produces heart-shaped leaves with a deep green center and cream-colored margin. When provided with nutrient-rich soil and plenty of water, this shade-loving perennial is a fast grower. To maintain its overall health, growers should be conscious of planting in areas that get excessive amounts of sun, particularly in the afternoon. Growing as filler under large trees or in other shady areas will be ideal. The flowers are notable for their fragrance and for their pale lavender color. The Royal Standard usually grows to be between 18 and 24 inches, and includes large leaves with a glossy finish. They do well in Florida's warm weather, but should be planted in a spot where shade is present. It should be given plenty of water; assuring soil is kept damp, but not wet. This will be especially important during extended periods of heat. Royal Standard will produce large white blooms that will have a faint, pleasant smell. It is an ideal pick to add color and texture to a shady garden area.